I’ve had a 3d printer for a while now and, for the most part, I’ve been printing other people’s designs and models. 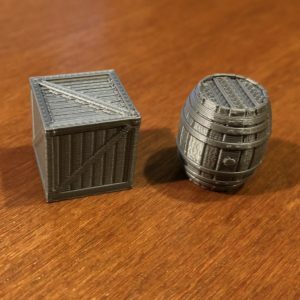 I’ve learned a bit about how to print a model (it’s still a bit of a roll of the dice, frankly) and I’ve printed some things to use at our Game Night, but one of the main reasons I wanted a 3d printer (in addition to simply learning about a new thing and thinking they’re cool) is that I wanted to create my own models. I’ve toyed with it a bit, but I still have a lot to learn. In any case, between persistence, stubbornness and some better resources, I’m finally making some progress. My goal on this front, I kid you not, was simply to make a barrel. Just something that looked like a barrel. This sounds trivial, but it’s not. I could list the lessons I learned about modeling and using deformation cages/lattices, the rigor that has to be applied to a model so that it is printable (learned a new use of the word manifold). I had to rebuild this barrel no fewer than three times, from scratch, before I was ready to let it go and saved a dozen versions. 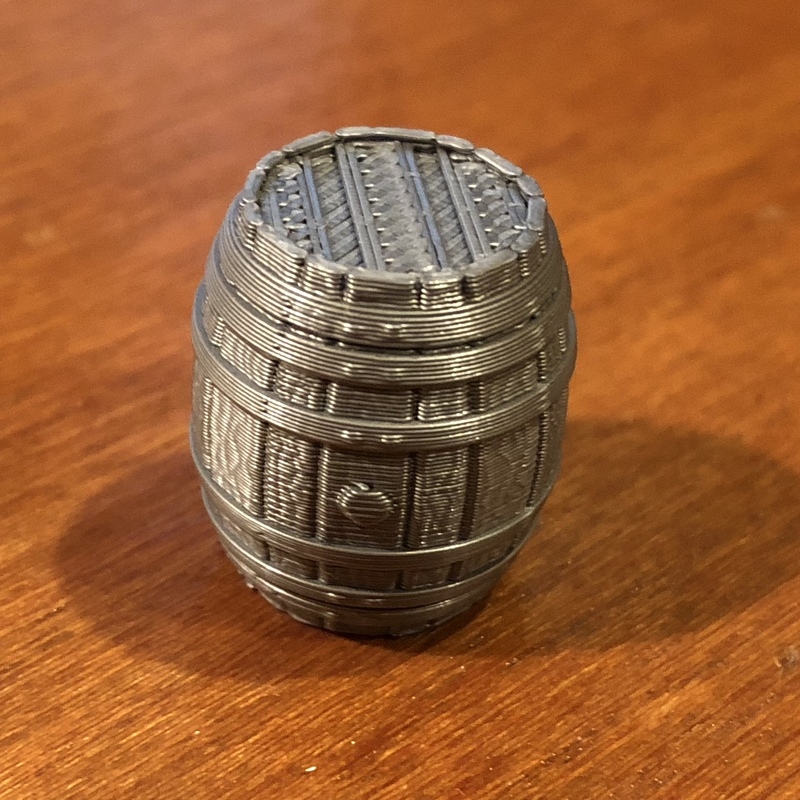 Even with that, I am also discovering the limitations of (my) consumer grade 3d printer which is demonstrated by the loss of detail at this small scale. That barrel on the left is about 2cm tall, roughly 2/3rds the height of a mini and appropriately sized for a game. But it also means the wood grain I lovingly sculpted in to the staves is largely lost and you can see the individual strands that make up the plastic which is melted to form the top. Granted, by the time I paint it, it’ll less obvious, but it was a lesson. Oh! The Crate, you ask? I thought titling this Crate and Barrel was funny. You know, like the store. Ha! See, it’s even funnier when I point it out.